MOSCOW (AP) — Two of the best teams in international soccer go into their final group matches in danger of being bounced from the World Cup. Germany and Brazil, both early favorites for the title, struggled through their opening two matches. The teams have a combined nine World Cup titles, Germany is the defending champion and Brazil is still trying to redeem itself from a humiliating 7-1 loss in the 2014 semifinals, in which it was the host nation. Germany was shocked in its opening match in Russia by losing to Mexico, and the squad needed a goal in stoppage time from Toni Kross to pull out a 2-1 victory over Sweden. 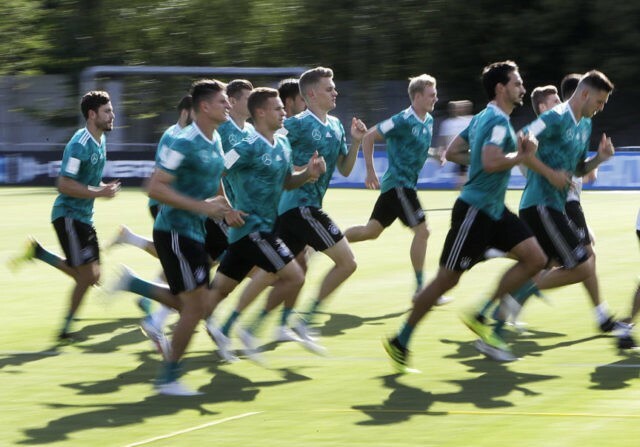 To avoid elimination in the first round of the World Cup for the first time since 1938, Germany needs a strong showing on Wednesday against South Korea in a wide-open Group F finale at Kazan Arena. Germany coach Joachim Loew has been blasted at home for conservative roster choices. So Loew made four changes against Sweden, including dropping playmaker Mesut Ozil from the starting lineup. The changes made for a balanced team that was relieved to pull out the win against Sweden. South Korea’s chances to advance are slim, and captain Ki Sung-yueng won’t play because of a left calf injury. If South Korea beats the four-time world champions, and Sweden loses to Mexico, the squad could make it to the round of 16. Brazil, meanwhile, is trying to regain some swagger. The five-time champions head into their final group match against Serbia at Spartak Stadium in Moscow needing only a draw to advance. But after a 1-1 draw against Switzerland, Brazil needed two injury-time goals to pull out a 2-0 victory over Costa Rica. Neymar has been frustrated with the play of the national team, and he dropped to his knees and sobbed after the Costa Rica match. Serbia understands that it needs spectacular play to continue its tournament. Germany plays at 5 p.m. (10 a.m. EDT, 1400 GMT). Brazil is at 9 p.m. (2 p.m. EDT, 1800 GMT). With victories over defending champion Germany and South Korea, Mexico has a chance to win its group with a perfect record for the first time in its World Cup history. Mexico hasn’t yet secured its spot in the round of 16, but forward Javier Hernandez believes the squad is a contender to win the entire tournament. “We are brave enough not only to dream, but to work on those dreams so that we can make them true,” Hernandez said. Hernandez needs one goal to make him Mexico’s all-time leading scorer in World Cup play with five. But, if Sweden beats Mexico on Wednesday and Germany beats South Korea, three teams would be tied atop Group F with six points. That would make the tiebreakers go to goal difference. Sweden is in its first World Cup since 2006, but was deflated after German’s comeback 2-1 victory. The Swedish team took some solace from its play against Germany and insisted it is ready for its Group F finale against Mexico in Yekaterinburg. Switzerland found itself scrutinized following its 2-1 victory over Serbia because three of its players used the match to make political statements. FIFA fined three Swiss players for making hand gestures that seemed directed against their opponents because many Swiss players have ties to the former Serbian province of Kosovo. Switzerland will reach the round of 16 with at least a draw. Costa Rica was eliminated after losing its first two matches, which makes Switzerland coach Vladimir Petkovic wary of the match in Nizhny Novgorod.